Another ‘lifer’ yesterday: a Sea gherkin Pawsonia saxicola, at Castle Beach in Falmouth. 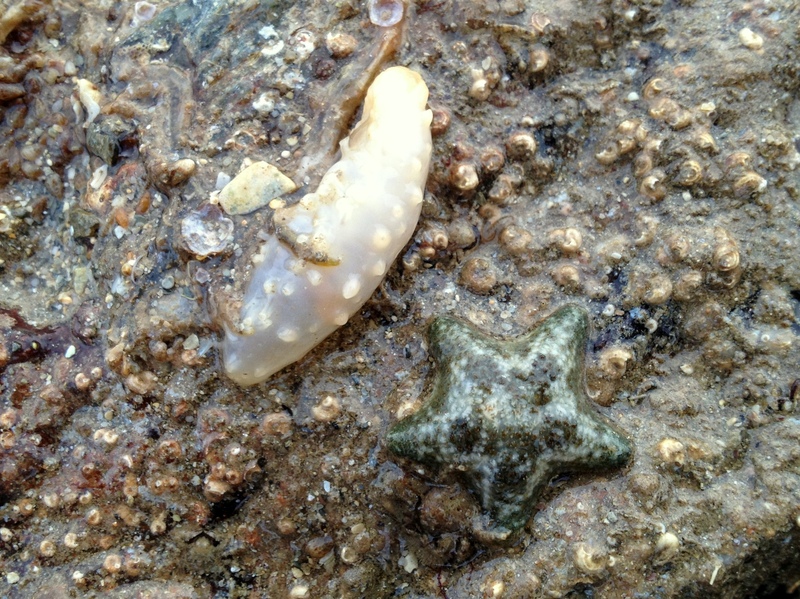 It is a small sea cucumber (a relative of the Cushion star next to it); a very cool find indeed! This entry was tagged Apletodon dentatus, Calliostoma zizyphimum, Castle Beach, Cushion star, Falmouth, Gibbula umbilicalis, Gobiusculus flavescens, Grey top shell, Marthasterias glacialis, Painted top shell, rock pooling, Sea cucumber, Small-headed clingfish, Spiny starfish, two-spotted goby. Bookmark the permalink. Really like that gherkin! Cool indeed 😉 Looking forward to see the Gobie, they are beautyful. Never managed to catch one yet, they are so fast.